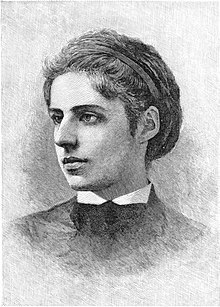 Emma Lazarus (July 22, 1849 – November 19, 1887) was an American author of poetry, prose, and translations, as well as an activist. She wrote the sonnet "The New Colossus" in 1883, which includes "lines of world-wide welcome". Its lines appear inscribed on a bronze plaque on the pedestal of the Statue of Liberty, installed in 1903, a decade and a half after Lazarus's death. The last stanza of the sonnet was set to music by Irving Berlin as the song "Give Me Your Tired, Your Poor" for the 1949 musical Miss Liberty, which was based on the sculpting of the Statue of Liberty (Liberty Enlightening the World).